In case you are New York Yankee fan, a baseball player, or even just a Jordan Brand shoe collector, JB is giving you a threat with the cleats edition of the Jordan Melo M8. 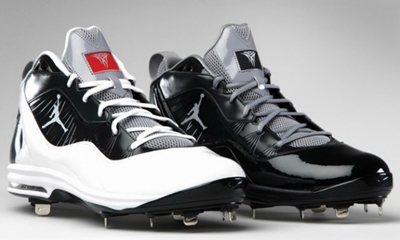 Sported by CC Sabathia in the current MLB season with the Yankees, the Jordan Melo M8 Cleats is available in Black/Cool Grey and White/Black/Cool Grey colorways, which features Flywire Technology on the upper part and Air Max in the heel. Check this out and rock it on the mound!